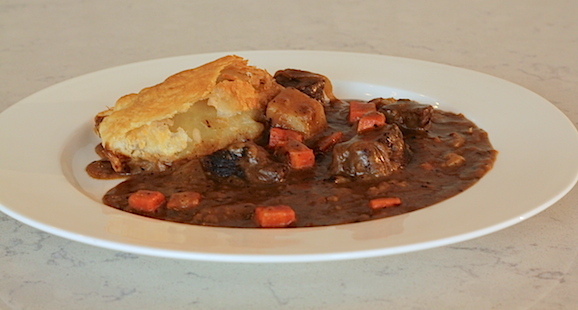 Dan’s Canadian interpretation of the classic Irish beef and stout pie. Moose meat and Guiness add exceptional flavour to a stew of hearty carrots, potatoes and onions. Simmered to perfection, the stew is then topped with puffed pastry to create a cozy, downhome meat pie. A side of mashed potatoes, sautéed cabbage or crusty bread is optional but an accompanying pint of stout is highly recommended. • Slice your moose into smaller than usual cubes and add black pepper and salt. • Oil and heat a frying pan to a high heat and add your cubed moose. Remember the pan is hot enough when you hear an immediate sizzle. • Chop your onion, carrot and potato and add to the frying pan. • After the moose and vegetables have had a chance to sweat down, stir in the flour and butter then add your stout and water. • Add in some salt and allow to bubble away for a bit. • Remove from heat and allow to cool. You may want to place the stew in the fridge. • Remove from fridge and cover with your puff pastry and place in a 400 ° F (200° C) oven for 40 minutes.